We specialize in connection, not perfection. Here you'll find products, services and classes to help you connect and heal in YOUR family from the comfort of home. Please pay as much as you can afford to support the work we're doing here at The Consciously Parenting Project. We strive to make our information affordable for all families. If you can afford more, you're helping to support a family who might not otherwise be able to have the support, so thank you for paying more when you can. Together we make the world a better place. "I'm striving for my family to be emotionally healthy, unlike my own family when I was growing up. I want to find a way to set loving boundaries so I don't feel walked over. I need to find a way to handle feelings that feels better for us all. My goal is to have things feel better all around in my family." 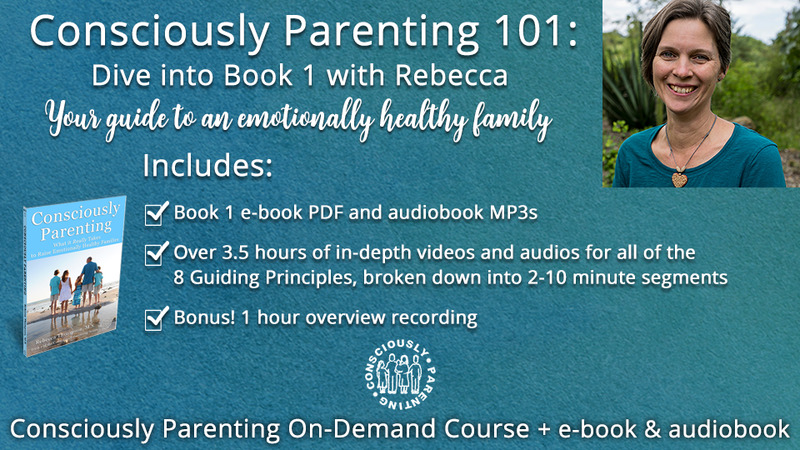 If I could recommend just one resource to all families, it would be the Consciously Parenting 101: Dive into Book 1 with Rebecca Thompson Hitt. Whether you’re working to heal or integrate experiences together or you’re doing ok and just want to keep heading in that direction as your children grow, no matter how old your kids are (even if you haven’t conceived yet), this is the resource for you. This book, Consciously Parenting: What it Really Takes to Raise Emotionally Healthy Families, touches on all the areas of family life that parents get stuck. Feelings, boundaries, understanding what your child is communicating, learning how to prioritize the relationship, and making space for your own needs to be met. It’s a growth tool that doesn’t judge or shame, but helps you to see things in a new and healthier way. The package comes with 8 modules, one for each of the Guiding Principles in Book 1, each with about four 5-9 minute videos for a total of over 3.5 hours of content. The Guiding Principles are there to guide you to find your own answers, rather than being a list of things to do. You also get both the full audiobook and the PDF version so you can follow along. Exercises and practical things you can do in every module are included to help you really understand the material and apply it to YOUR family, starting today. Our products and services all focus on supporting you to create, nurture and heal connection in your family from the comfort of home. Why? Because we're parents, too, and we know you want your home life to feel good. (And we know what it feels like when it doesn't feel good!) We also get that your time is limited, so we've made our resources accessible (many are downloadable) and affordable. All our information is based on the latest research in attachment, epigenetics, brain science, sociology, trauma, pre and perinatal psychology. We've read the research so you don't have to. We provide the tools, support, and inspiration to help you find your own way. Now in our 10th year of supporting families around the globe, we've become a name you can trust to help you find your way to stay connected in your family and heal. No one-size-fits-all approaches here. Each family is unique. Each person's story is unique. When you buy from us, you're supporting families, not a large corporation, and you're helping to change the world one family at a time. Many of our services are discounted and many of our resources are available for free so that everyone has access regardless of ability to pay. Because everyone needs support. Purchasing resources here helps us continue our work creating rich content and inspiring connection and peace in homes around the world. 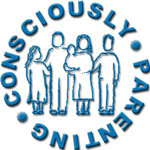 The Consciously Parenting Project, Inc., was born when Rebecca found herself really struggling to be the parent she wanted to be with her first born. 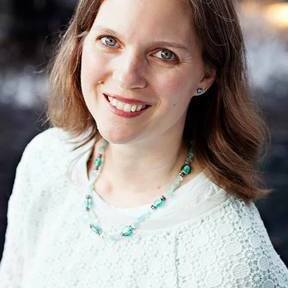 Despite her masters in marriage and family therapy and degree in education, she wasn't sure how to create the family she wanted and heal those things she didn't do the way she wanted. As she found her own way through a series of people who pointed the way back to connection, she was inspired to create resources and offer support for others who would find themselves in similar places. We all want our families to feel good and we need to know how to create healing spaces when they're needed. Rebecca is the mom of 2 boys, ages 13 and 18 and bonus mom to a 20 year old daughter and 23 year old son. She's messed up plenty of things in parenting, but is here to walk beside you as you find your own way. All our resources are created with this in mind. When Rebecca isn't supporting parents or creating parenting resources, you'll find her either in the kitchen cooking or traveling with her boys and husband. While everything here is available virtually or through the mail, Rebecca does have an office and will occasionally see clients at that physical location. You can also purchase books and other physical resources (like CDs) there as well, by appointment only.